The practices of Buddha Heruka and Buddha Vajrayogini are the Highest Yoga Tantra practices ofKadampa Buddhism. 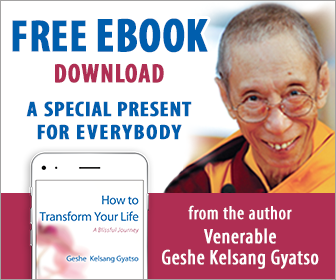 The practice of Buddha Heruka is explained in Geshe Kelsang’s book, Essence of Vajrayana. and the practice of Buddha Vajrayogini is explained in the book Guide to Dakini Land. Before engaging in either of these practices it is necessary to receive an empowerment and instructions from a qualified Spiritual Guide. These empowerments are given every other year atInternational Kadampa Festivals, and occasionally at other events. “The Sanskrit term `Heruka’ is composed of the three syllables, `He’, `ru’, and `ka’. `He’ teaches the emptiness of phenomena in general, and `ru’ the emptiness of persons in particular; together they reveal the emptiness of all phenomena. 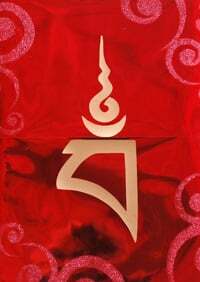 `Ka’ refers to the union of Heruka’s mind of great bliss and the emptiness of all phenomena. This union is Heruka’s Truth Body. An I, or self, imputed on this Truth Body is definitive Heruka, the real nature of Buddha Heruka. This can only be seen by Buddhas. Another term for Heruka is `Chakrasambara’. `Chakra’ means `wheel’, and in this context refers to the `wheel’ of all phenomena. `Sambara’ means the supreme bliss, which is called `spontaneous great bliss’. Together `Chakra’ and `sambara’ reveal that by practising Heruka Tantra we gain a profound realization that experiences all phenomena as one nature with our mind of great bliss. This realization directly removes subtle dualistic appearances from our mind, and due to this we quickly become definitive Heruka. To lead fortunate disciples to the state of Buddha Heruka within one life, Buddha Vajradhara manifested his compassion in the form of interpretative Heruka, who has a blue-coloured body, four faces, and twelve arms, and embraces his consort, Vajravarahi. Attaining the state of Buddha Heruka depends upon abandoning the twelve dependent-related links of samsara by gaining the realizations of the four doors of liberation; and in particular it depends upon realizing the union of great bliss and emptiness. These are symbolized respectively by Heruka’s twelve arms, his four faces, and his embracing Vajravarahi. It is possible that those who do not understand the deep meaning of Buddha’s Vajrayana teachings may feel uncomfortable with Heruka’s wrathful aspect. Such practitioners need to understand that all phenomena are equal in lacking inherent existence. In ultimate truth, emptiness, there are no wrathful or peaceful aspects because all phenomena are of one nature. Therefore, those who possess deep knowledge of ultimate truth have no basis for developing unpleasant feelings upon perceiving unattractive objects because they realize that ultimately there are no truly existent unattractive or attractive objects. For example, although Heruka’s long necklace of human heads may seem to be real, in fact it is a manifestation of Heruka’s omniscient wisdom. All the various features of Heruka’s body are merely manifestations of his omniscient wisdom and do not exist outside of his mind. However, for faithful practitioners, visualizing the wrathful aspect of Heruka is a powerful method for swiftly receiving his blessings and protection. It is for this reason, as well as to display in a visible manner how to progress along the entire path of Sutra and Tantra, that Buddha Vajradhara emanated the wrathful Deity Heruka. Buddha Vajradhara, Buddha Shakyamuni, and Buddha Heruka are the same person, differing only in aspect. When Buddha turned the Wheel of Dharma of Sutra he appeared in the form of an ordained person, when he turned the Wheel of Dharma of Tantra in general he appeared in the form of Vajradhara, and when he turned the Wheel of Dharma of Heruka Tantra in particular he appeared in the form of Heruka. Heruka is Buddha’s mind of compassion manifested as form. Only Buddhas have the ability to display their minds as form. We sentient beings are unable to do this because our mind and body are different natures, but a Buddha’s mind and body are the same nature and so wherever their mind goes their body goes too. We always perceive a gap between our mind and its object. This is a mistaken perception, or mistaken appearance. Having completely abandoned this mistaken perception, Buddhas have the ability to display their mind as form, such as the forms of living beings and inanimate objects. For this reason it is said that Buddhas’ emanations pervade the whole universe. “The two stages of the practice of Vajrayogini were originally taught by Buddha Vajradhara. He manifested in the form of Heruka to expound the Root Tantra of Heruka, and it was in this Tantra that he explained the practice of Vajrayogini. All the many lineages of instructions on Vajrayogini can be traced back to this original revelation. Of these lineages, there are three that are most commonly practised: the Narokhachö lineage, which was transmitted from Vajrayogini to Naropa; the Maitrikhachö lineage, which was transmitted from Vajrayogini to Maitripa; and the Indrakhachö lineage, which was transmitted from Vajrayogini to Indrabodhi. This commentary to the generation and completion stages of the Highest Yoga Tantra practice of Vajrayogini is based on the instructions of the Narokhachö lineage. The instructions on the practice of Vajrayogini contain concise and clearly presented meditations that are relatively easy to practise. The mantra is short and easy to recite, and the visualizations of the mandala, the Deity, and the body mandala are simple compared with those of other Highest Yoga Tantra Deities. Even practitioners with limited abilities and little wisdom can engage in these practices without great difficulty. The practice of Vajrayogini quickly brings blessings, especially during this spiritually degenerate age. It is said that as the general level of spirituality decreases, it becomes increasingly difficult for practitioners to receive the blessings of other Deities; but the opposite is the case with Heruka and Vajrayogini – the more times degenerate, the more easily practitioners can receive their blessings. Whenever Vajradhara expounded a Tantra he emanated the mandala associated with it, but after completing the discourse he would usually reabsorb the mandala. For example, when he expounded the Root Tantra of Kalachakra he emanated the Kalachakra mandala, and when he had finished he reabsorbed it. However, he did not reabsorb the mandalas of Heruka or Vajrayogini. These mandalas still exist at various places throughout this world, such as in the twenty-four holy places. Because of this, human beings in this world have a special relationship with Heruka and Vajrayogini and can quickly receive their blessings. Furthermore, in the Root Tantra of Heruka Vajradhara promised that in the future, when times became spiritually degenerate, Heruka and Vajrayogini would bestow their blessings on those with strong attachment.